(CBS/AP) SAN JUAN, Puerto Rico - The man who has called himself the mastermind of the Sept. 11 attacks is seeking to wear military-style clothing at his upcoming war crimes trial in Guantanamo, one of his attorneys said Wednesday. Khalid Sheikh Mohammed has asked to wear a camouflage field jacket and camouflage turban with traditional Pakistani clothing as he goes on trial with four other men at the U.S. base in Cuba on charges that include murder and terrorism. Mohammed wanted to wear the items at his May 5 arraignment but prison officials refused to allow it. They also rejected some clothing requested by other defendants as inappropriate for the military tribunal. But his defense team is asking the judge to overrule that decision, arguing in newly released court papers that Mohammed is seeking to wear items customarily worn by members of a militia and that it violates his right to a fair trial and historical precedent by forbidding him to do so. "He's being prosecuted for violating the laws of war in the context of hostilities," said Army Capt. Jason D. Wright, a member of Mohammed's Pentagon-appointed defense team. "War crimes defendants during the Tokyo and Nuremberg tribunals apparently had a right to wear military-style clothing, and it's unlikely that the U.S. had a problem about Mr. Mohammad's particular clothing when he was part of the U.S.-backed mujahadeen in Afghanistan who fought the Soviets." As CBS News senior correspondent John Miller reported in April, this isn't the first unusual request to come from Mohammad while at Guantanamo. "He is, in many ways, an attention junkie," Miller wrote. "His time in Guantanamo did little to blunt this." After meeting with the Red Cross for the first time since his capture in 2003, Mohammed was less interested in talking about waterboarding or the conditions of his captivity than he was with getting a picture taken with a more proper, longer beard, Miller reports. The fact that the photo released after his arrest showed him in a dirty T-shirt with mussed hair was driving him crazy. The man who wanted to be known for the plot that left nearly 3,000 innocent people dead found the arrest photo undignified. While planning carnage in the name of Shariah law, Mohammed and his cousin were regulars in the Manila strip clubs, Miller reports. Mohammed once tried to woo a dental hygienist he had a crush on by using money that was supposed to be for terrorism to hire a helicopter and fly by the window of the office she worked in. 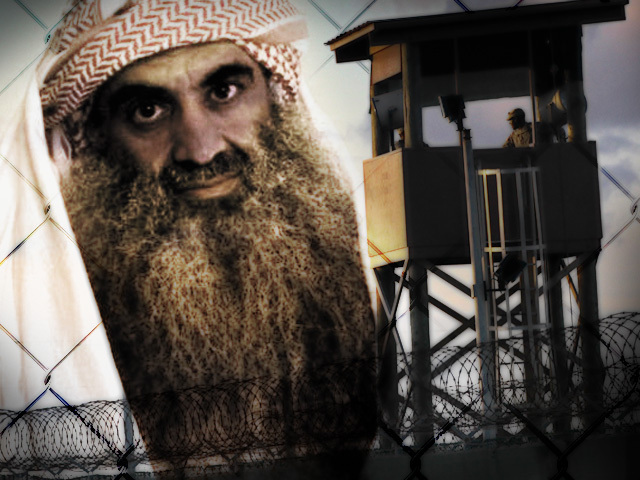 Mohammad's lawyers also argue that denying him the right to wear the clothing of his choice is attempt to break him down psychologically, a continuation of the harsh interrogation, including being waterboarded 183 times, that he endured in the CIA's clandestine prison system before he was brought to Guantanamo in September 2006. "This appears to be another attempt by the U.S. government to continue one of the aims of the CIA's now-condemned torture program as an attempt to psychologically disintegrate these so-called enemy prisoners from their individual and social personalities," Wright said in an interview. Mohammed and his four co-defendants could receive the death penalty if convicted of charges that include nearly 3,000 counts of murder for their alleged roles orchestrating and aiding the Sept. 11 attacks. Mohammed has previously stated he was the "mastermind" of the attacks and indicated he would plead guilty but he and his co-defendants have not yet entered pleas in the case. Their May arraignment dragged on for nearly 13 hours as the men refused to respond to questions from the judge and wouldn't listen to Arabic translations in a protest that seems to have been sparked by the military's refusal to allow the clothing of their choice. Defendant Walid bin Attash, who also wanted to wear a camouflage field jacket, was placed in a restraint chair at the start of the hearing. Another of the men, Mustafa Ahmad al-Hawsawi, had sought to appear in an orange jumpsuit similar to those worn by the first prisoners who were brought to Guantanamo and which are now often worn by protesters around the world at demonstrations calling for the closure of the prison. "Mr. Hawsawi wished to wear the orange prisoner jumpsuit as a silent reminder of Guantanamo's legacy of torture and in peaceful defiance of a system that is built to kill," said his lawyer, Navy Cmdr. Walter Ruiz. In a legal motion released Tuesday, prosecutors ask the judge in the case not to overrule the prison camp officials who deemed the clothing items unsuitable for sessions of the court, known as a military commission. "The detainee's attire should not transform this commission into a vehicle for propaganda and undermine the atmosphere that is conducive to calm and detached deliberation and determination of the issues presented and that reflects the seriousness of the proceedings," the prosecutors wrote. The detention center commander, Rear Adm. David B. Woods says in an affidavit accompanying the motion that he forbids "excessive clothing" for security reasons because it could allow prisoners to hide contraband more easily or make it harder for the guards to gain control if necessary. Woods also says the prison forbids "clothing that is inconsistent with the decorum and dignity of a court proceeding whether in the United States or the Middle East, and which could undermine good order and discipline." Lawyers for the defendants say that camouflage should not conflict with the decorum of the court since guards inside the courtroom and prison officials wear military fatigues. The judge is expected to hold a hearing on the clothing issue at the next court session, scheduled for August.